With this update, our developers shifted their attention towards one of AWR Cloud’s trademark features – SEO reports. Come to think about it, this was the applications’ core-feature, which was originally designed as a cloud platform for sharing AWR Desktop reports. But this was ages ago, and in time, AWR Cloud’s SEO reports evolved from simple, keyword ranking ones, to complex, multiple-section, highly customizable ones with white-labeling options. Recently we felt that their design could be improved, and with our latest application release, we are proud to introduce a new look for the printable reports. The redesign process was triggered by the need to make our HTML and PDF files more similar to each other, and especially to match the information displayed in the UI. While their sections and data are virtually unchanged, reports will feature an updated and more friendly appearance. CSV reports have not been changed, and those of you using them will not be affected – this includes reports generated via API as well. Don’t worry though! All your existing reports and settings are still available, but with a fresh look, and your scheduled reports will be automatically upgraded to the new design. For those of you using AWR Cloud’s white-label feature at its fullest, now you can take it one step further and customize your reports with your account’s personalized colour theme. Access the Reports – Brand templates section, and choose a colour set to match your company’s style. By default, reports will use the standard colours of AWR Cloud, but any of the other five sets can be used instead. Head over to your AWR Cloud account and generate your own reports to check out the changes! In addition to these awesome reports upgrades, this new release comes with a few major UI redesigns, as well as minor updates and bug fixes. Let’s see what else is new! A major UI improvement introduced today is the ability to sort your metrics by change and view the keywords with modified rankings. 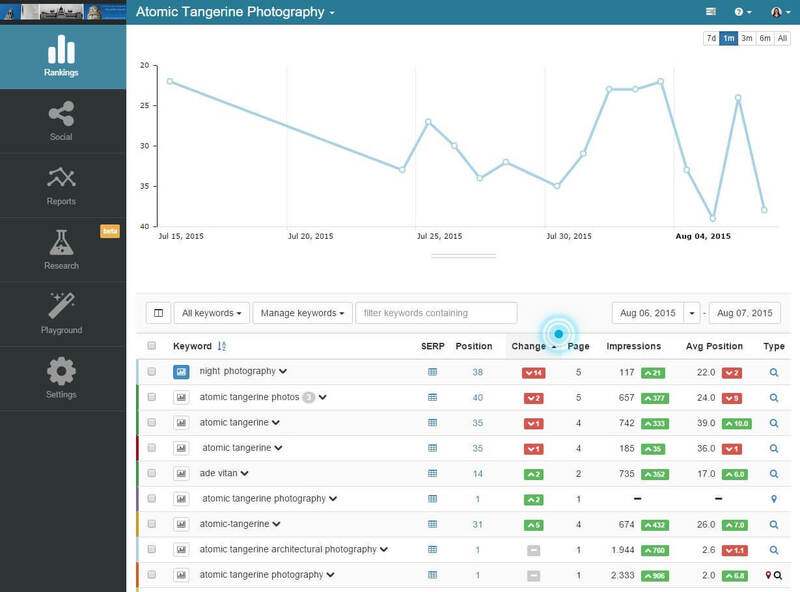 You can compare changes over different search engines or against multiple competitors at once. This is a fast and easy way to identify specific keywords on which your rankings were impacted between two consecutive project updates. First off, you can identify the positive variations brought by your SEO campaigns. Your keywords that changed for the best can be isolated from the list using the new sorting option in the AWR Cloud interface and you can see how well your efforts paid off. Since change is quantifiable from update to update, you will precisely see how much your rankings increased so you can focus your efforts and make sure no opportunity is missed. The second way to use this keyword sorting method is to highlight the opposite: rankings that moved down. Once these ill-performing terms are known to you it’s easy to analyze the cause of the problem and start addressing it. It can be due to a change in strategy, or perhaps your competitors have upped their game. But besides these two obvious reasons that might be already known to your SEO team, having a way to access a list of badly-performing keywords can uncover deeper issues. To name a few, dropped rankings can hint at performance problems, technical setups gone wrong or penalties received by your website. Knowing that a problem exists is the first step towards fixing it – and AWR Cloud’s new sorting option aims to help you identify potential problems from the start by fully analyzing the search performance of your key terms. Starting with your next project update, you will be able to sort your keywords by change and take control of your strategy! Our trademark Visibility metrics were definitely in need of some attention, as the Rankings – Visibility report lacked some of the features and visual improvements made to other parts of the application. As a result, the entire section gets a major facelift, both in design and functionality. With improved usability and more data customization options, the Visibility section in AWR Cloud becomes a central hub for all your rankings and overall website visibility metrics. 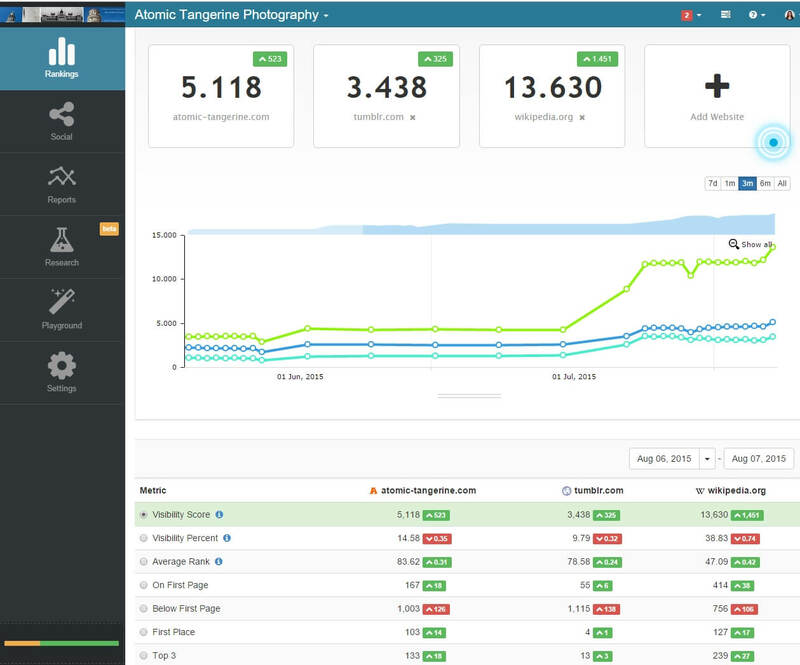 The main Websites Visibility tab will show your visibility metrics side by side with your closest competitors. You can then easily navigate towards extended keyword ranking reports, and explore in-depth metrics for each of your targeted terms. If you’d like to focus on various markets instead, the Search Engines Visibility tab will now calculate and display relevant data across the search engines added in your project. Regardless if you’re tracking universal, mobile or local rankings, you can assess your SEO campaigns’ success in one place. With the recent focus on mobile, you can make the most of this new search engine visibility view and compare your desktop versus mobile search metrics, side by side! All this information was already available in AWR Cloud, but with the re-designed Visibility sections, it’s all coming together nicely in a single report. And we didn’t stop here. The best addition to this section is the URL Visibility tab, that breaks down your website’s visibility metrics per URL. Neat, right? If you’re targeting specific pages in your website’s optimization strategy, this report is for you. For your best ranking pages, we have put together detailed SEO metrics calculated for each URL. 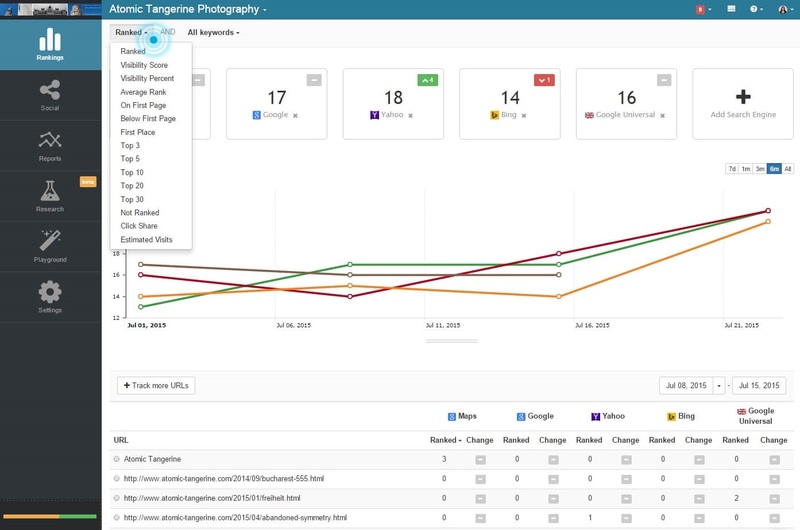 You can compare your visibility score, the number of ranked keywords by position ranged or their average rank across several search engines, assess their change and evaluate your SEO efforts. 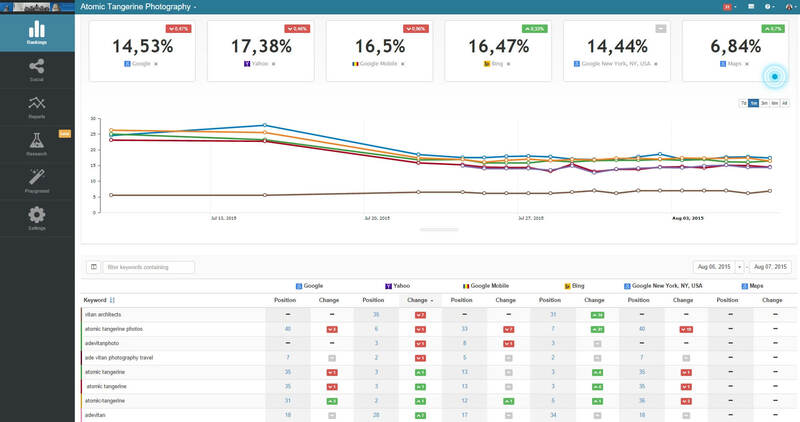 Keeping up with the visual guidelines of the new Visibility report, our popular SEO comparison reports (Search Engine Comparison and Website Comparison) both receive a well-deserved facelift. Their Default views feature a modern design and put the most important information at your fingertips. 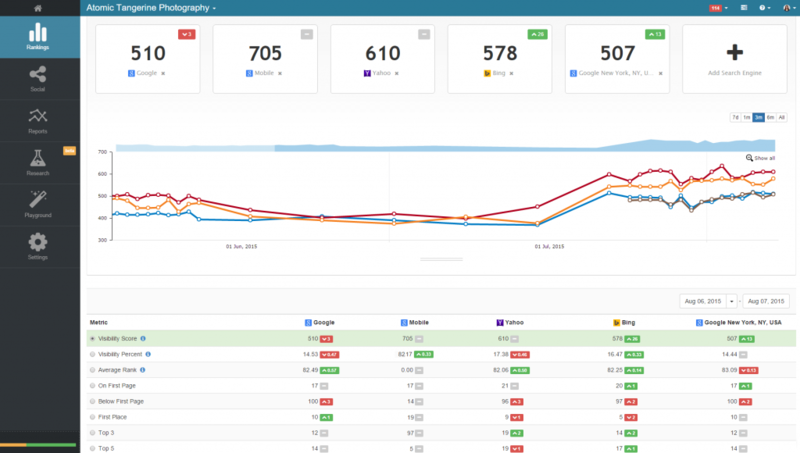 No matter your device, you can easily add relevant items to the display and compare your SEO metrics in a compact streamlined view. In these new views you can compare a maximum of six items (search engines or competitors) so if you’re interested in exploring your metrics in-depth, head over to the Extended tabs. These are the previous Search Engine Comparison and Website Comparison views, where you can add all the information you want to the screen, analyze it and even generate a Quick Report with. In order to match Google’s latest SERP improvements regarding the display of local business results, AWR Cloud updated its search engine ranking gathering process. Local listings will be correctly interpreted by our system, regardless of the way Google chooses to display them during a search. All you need to do is make sure to add a website alias that matches your business name! So for all of you SEOs focused on local rankings for your clients, head over to the Website Settings tab of the application and update your information! These are the major improvements brought by our latest application release, but a series of minor issues and bugs were also fixed and are now available. I feel that the features highlighted earlier will have the most impact on your AWR Cloud workflow – so tell me, what do you think about our latest changes? Feel free to share your thoughts and feedback in the comment section below – I’d be happy to get back to you! Hi Ade, many thanks to your team for this improvement. I have a question. How I can make a report incuding Google Search Console data as I see on your 1st screenshot ? Hello Alexandre, thank you! I’m happy you like our latest features. To add Google search metrics (impressions, clicks, average position, CTR) you first need to connect your Search Console account to that project (Settings – Webmaster Tools section in AWR Cloud). Once the metrics are gathered (it takes a bit), you can generate a keyword ranking report (regular or quick report) that includes these metrics. In the UI, there is a choice to add more columns into display, so go ahead an choose those you’re interested in. Similarly, in a keyword ranking report section, use the ‘advanced’ option to add the columns you need, and then run your report. Let me know how this goes, and for any additional details you can always get in touch with our support team. They are always happy to help with more information! All great stuff. Would be nice to be able to convert the Google Analytics report into a PDF file I can give my clients. Thank you! We do have an Analytics section in our PDF & HTML reports, that includes a global traffic chart with all your Analytics channels, as well as e-commerce information, over a time range of your choice. The report is very similar to the information displayed in the Rankings – Overview, Analytics tab in the UI. It also puts this information against a Visibility trend line, so you can see how rankigns’ variations affected traffic. In the Reports – Edit Reports menu, just create a new PDF report and choose the ‘Analytics Dashboard’ section for any project previously connected with Google Analytics (you can connect it under the Settings menu). Let me know how this goes, and if you need any extra details about this, send us an in-app message and we’re ready to help! Any way to use the now legacy report layout/design rather than the new one?